Flextral manufactures one of the world’s most expansive selection of hydraulic hoses in the United States today. Flextral offers a diversified product line of SAE and ISO compliant hydraulic hoses and hydraulic hose fittings. Our products are widely used in such industries as agriculture, transportation, construction, chemical, petroleum, manufacturing, pressure washing, welding, mining, forestry, food processing, material handling and more. 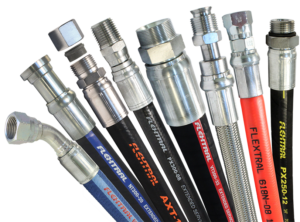 Flextral also offers a complete line of industrial hose and industrial fittings engineered for use with commercial truck, jackhammer, water, air, petroleum, chemical and material conducting. Flextral also carries a complete line of hydraulic equipment, hydraulic accessories, and hydraulic adapters.